SPJ’s national elections are coming up Sept. 7 to 9, in conjunction with our national convention in Anaheim. All SPJ members can vote for members of the national board. Watch your email in-box for an electronic ballot. SPJ’s Election Central webpage lists who is running (Note: I am running uncontested for another term as Region 2 director), as well as a submitted bio of each. I asked candidates in the four contested races (president-elect, vice president of campus chapter affairs, student representative and Region 10 director) to also answer a short questionnaire. Here are their replies, edited only to fix the occasional typo or style point. It boils down to leadership and tried and tested organizational skills. For example, before joining the national board, I led the New York Deadline Club through a period of change, as we digitized our awards contest; grew our annual scholarships from $3,000 to $10,000; revived the Hall of fame, celebrating exceptional journalists; and recruited diverse new board members from top-flight media outlets. 2 – Do you support the plan to overhaul SPJ’s board of directors? What specifically do you like and/or not like? Yes, absolutely. From the time when the notion of creating a smaller board first floated on national board emails, I’ve enthusiastically supported it. This has the power to transform the national governing body and to shift our focus to more long-term strategic initiatives. Although it is natural to analyze the details of such a complex proposal, and I hope the delegates will do so in Anaheim, I believe it to be a completely sound and extremely well thought out plan. 3 – What is one specific change you would try to make to SPJ if elected to the board? I’d like to broaden the talent pool in our continued pursuit of excellence, and give more members a voice in how SPJ is governed. This trend is already well established with the creation of SPJ communities and One Member, One Vote, which enfranchised all SPJ members. I believe we can do more to seek the creative input of our membership and other key constituencies, to include professional groups like our #EIJ partners, prominent journalists and experts in related fields such as technology, media relations and academia. 4 – What is an example of a change you have made or helped make within SPJ? I’ve made many contributions to SPJ policy changes at both the local and national levels. For example, I chaired the revision of our chapter bylaws and we posted them to our website for the first time. At the national level, at the request of then-President Paul Fletcher, I chaired the governance task force that crafted a plan to represent the 41% of unaffiliated members at national conventions. 5 – Why is SPJ important to you? As a journalist, it has been rewarding to belong to an organization that aims to develop its members’ journalism skills, high ethical standards and personal networks. By cultivating these essential attributes, SPJ helps ensure a freer society through its members. For the last decade, I’ve been part of this process as an SPJ volunteer — at the chapter, national committee and national board levels. Through this association SPJ has made me the better for it. 6 – What is your best moment or achievement in journalism? I had the good fortune to cover a story of historic dimensions: the 2000 presidential vote recount in Palm Beach. While in Florida to cover another story for Forbes, where I was a staff editor at the website, I scored one of the first interviews with a local election official the morning after the polls closed. The three local election officials struck me as ordinary people caught up in extraordinary circumstances, as I pointed out in the lede of my first piece that week. (https://www.forbes.com/2000/11/13/1113recount.html) I then joined the press pool observing the hand recount of the ballots with the notorious “hanging chads” and filed several more items to our site before the Supreme Court ended the recount. I want to help lead SPJ into the future with our new board structure (if the SPJ delegates approve it). Because I was on the task force, I do believe I am best person suited to oversee that transition. I have led my chapter as president. I lead a newsroom. I belong to several national committees. I am confident that I can competently serve SPJ without having been on the national board before. One of the duties of the president-elect is to serve as the SPJ liaison to next year’s EIJ planning committee. I have served on such a committee for another national journalism convention before, so I have experience in that area as well. As the liaison, I will be sure to reach out to our committees, especially diversity, ethics and FOI, so I can get their input on workshops and sessions. I want to be more inclusive. Since I was on the task force to overhaul the board, I am enthusiastically in support of it. There are many things to like about this proposal. One of my favorites is that it allows regional directors to focus on their regions and chapters again. Much of an RD’s job is focusing on their national board duties, but I know how much having an active regional director can really help a chapter. If this passes, my hope is RDs put a lot of efforts into assisting and growing SPJ’s chapters since they are often a direct link to our members. My local chapter is lucky to be flush with cash, so we’re able to provide support, training and programs to our local journalists. The reason we have so much money is because of our annual awards contest, of which I have been in charge of for several years. One of the biggest expenses, though, is the back-end system. I would push SPJ national to negotiate a national discounted rate with one of the main programs out there, especially in order to help SPJ chapters launch new contests. This would be a win-win for everyone. As president of my local chapter, I launched my “no journalist left behind” initiative and expanded our borders to include the entire state of Florida. I wanted to have every SPJ member in the state covered by an active SPJ chapter. Since doing that, we’ve had board representation in other areas of the state. SPJ has been apart of my life for 10 years now. It helped me grow professionally and personally. When I was in college, I wrote an investigative story exposing the student body president embezzling money. He was forced to resign. It was that story that really drove home point that journalists can make change with their stories. I’ve kept that lesson close to my heart. I believe I have a greater depth and breadth of experience, along with an extensive record of service to SPJ and journalism at both the student/campus and professional level. My involvement with SPJ began as a student and continued as an officer in two pro chapters. I served as president of the Maryland Pro chapter (which was named small chapter of the year during my presidency) and as corresponding secretary for the D.C. Pro chapter. I have been the adviser to the University of Maryland student chapter for the past 18 years. In that time, our chapter has been named outstanding regional chapter several times. At the 2015 EIJ conference, the chapter was named SPJ’s National Campus Chapter of the Year. I have been honored to have been selected for SPJ’s Distinguished Teaching in Journalism Award and the David Eshelman Outstanding Campus Adviser awards along the way. Since 2002, seven of our University of Maryland SPJ chapter members have received SPJ’s Julie Galvan Outstanding Graduate in Journalism Award. I have served on the national SPJ board as a campus adviser at-large and now as the vice president of campus chapter affairs since 2013. I also served as the chair of SPJ’s Awards and Honors Committee. I have chaired and/or coordinated at least a half dozen SPJ Region 2 spring conferences and was co-chair of SPJ’s national convention when it was in Baltimore in 1992. For several years, I helped with coordinating the Mark of Excellence Awards in Region 2. In addition to my longtime membership in and service to SPJ, I have served on a number of other boards as well. They include the Chesapeake Associated Press Broadcasters Association and the National Capital Chesapeake Bay Chapter of the National Academy of Television Arts & Sciences. I wholeheartedly support the changes being proposed in the governance of SPJ. I think the restructuring is long overdue. My concern is ensuring that students, their faculty advisers and immediate post-grads would be guaranteed a voice at the top leadership table. I raised my concerns at the last SPJ board meeting. This resulted in a modification in the proposal that now includes a provision that if a campus representative is not elected to the newly reconstituted board, then one of the appointed positions to the board would go to a campus rep.
With a possible overhaul in SPJ’s governance on the table, we have to assess the impact of those changes first. If approved and the process does begin to overhaul SPJ’s operations, we can better assess what modifications and/or adjustments need to be made. That said, I would like to see SPJ focus on ways to improve our numbers when it comes to retaining former student members beyond their post-grad years. As a member of SPJ’s board I proposed — and the board approved — what is now our post-grad dues structure for the three years following graduation. That change allowed students following their graduation — who paid in full for two years of membership — to get a third post-grad year for free. For students struggling with low salaries and college debt, I believed then — and now — that SPJ needed to provide an incentive to keep them involved at least through the early years of their careers. In addition, I suggested the creation of our Mark of Excellence “Best of Show” MOEy award, which is unique among student journalism contests in that entries across platforms are considered for the honor. And, as another lasting contribution, a number of years ago I suggested finding time at our convention to give students a chance to meet, brainstorm and learn from each other about best practices for comes to campus chapters. That was expanded to include pro chapters, and is now a regular part of programming for SPJ at EIJ. I have been an SPJ member since my sophomore year of college. As a student, I discovered the benefits that SPJ provides in networking and providing a standard of professionalism with our Code of Ethics. Both as a professional and college instructor, I often point to SPJ as a strong and important voice on behalf of the First Amendment and the public’s right to know. I believe SPJ, with our Legal Defense Fund, provides a unique resource for journalists — college or pro — who need a place to turn to for assistance when their efforts to “get the story” turn into a legal challenge. It’s important to me to know that kind of support is available and not just to SPJ members — especially now, when journalism is under attack by the highest office in the country. For those reasons — and many more — SPJ remains important to me. There have been many and they began back in junior high and high school when, as editor of my newspaper, I wrote editorials that eventually resulted in changes in policy that were implemented countywide. That helped with setting my course for the future. As a professional, those moments came not necessarily with the big stories, but with the little stories, told about people or events that otherwise might not have had their story told. These days, those moments come in the stories and successes of my students. In particular, I am especially proud of a multi-year effort to obtain from our university a decade worth of records involving students who had been disciplined because of violations of the academic Code of Conduct as a result of sexual assault related charges. We finally got those records and the Student Press Law Center told me at the time we were the first student-based organization to get that kind of information from a university. It was a powerful message to the students at that time who had been repeatedly told that the provisions in FERPA prevented the release of that information. It was proof that perseverance can pay off. That was a tremendous moment and achievement. I spent the past year serving as campus representative to SPJ’s national Board of Directors, where I have helped revitalize the diversity fellowship, assisted in the selection of scholarship winners, established new relationships between SPJ and other associations supporting journalists and journalism, developed a new strategy for engaging membership with existing resources, brainstormed new ways to include student members in SPJ governance, and developing a new kind of student chapter in New York City. When I started this position, I had many ideas I thought the Society should implement. However, I soon learned that I lacked a proper knowledge of SPJ’s governance structure and internal politics, amongst other things (like the correlation between the board’s size and ineffectiveness). It became clear very early on that if I wanted to help effect real, lasting change in SPJ, I would need much more time than a year-long term, especially considering the proposed decrease in student representation on the national level. SPJ has demonstrated an inability to meet and maintain engagement with broader emerging audiences. What’s more — our response to this inability is concerning. Since then, I have committed a great deal of my time to understanding the challenges SPJ faces in a quickly evolving industry. I have been able to meaningfully contribute to the SPJ community at-large, while tweaking my original dreams for a 21st-century SPJ and what protecting and improving journalism means for the youngest of us, the future of news media. The biggest opportunity SPJ faces is, in both the short and long term, in the future of Quill magazine. As the oldest and one of the largest journalism organizations of its kind, the less than stellar performance of SPJ’s official publication is also concerning. It is also energizing, as it presents a new chance for SPJ and SDX to reintroduce its journo-education efforts to members and the public at large. I see the magazine as a vehicle through which other issues SPJ faces can be tamed (membership, diversity, engagement, sustainable revenue, etc.). In other words, Quill needs a major rebrand, and if the Society’s leadership gets it right, the fruits of that labor stretch far beyond quality content. My​ ​desire​ ​to​ ​educate​ ​others​ ​in​ ​media​ ​literacy​ ​comes​ ​from​ ​my​ ​father’s​ ​passion​ ​for​ ​people to​ ​have​ ​access​ ​to​ ​information.​ ​I​ ​can​ ​remember​ ​selling​ ​newspapers​ ​on​ ​the​ ​weekends​ ​and summers​ ​in​ ​St.​ ​Louis​ ​with​ ​my​ ​dad​ ​and​ ​older​ ​brother.​ ​Even​ ​then,​ ​I​ ​understood​ ​the importance​ ​of​ ​the​ ​free​ ​flow​ ​of​ ​information,​ ​and​ ​that​ ​who​ ​has​ ​access​ ​is​ ​just​ ​as​ ​important as​ ​who​ ​disseminates​ ​it. This is why I believe the (unedited) commentary I shared last summer with NPR’s All Things Considered is perhaps my proudest experience in journalism to date, aside from being elected to my current SPJ office. Active and unbiased inclusivity is an integral part of 21st-century journalism and I care about SPJ because it has the resources necessary for increasing media literacy at all levels of the multimedia community. In the coming months, I intend to help rebrand Quill, as well as grow SPJ’s student and institutional chapter ranks with bold and innovative ideas. As 2017-2019 vice president of campus chapter affairs, I will continue helping marginalized millennial voices find an intersectional platform in the Society of Professional Journalists. To be completely honest, I’m probably not the best person for the position. What I am is someone who wants to give back to the community — to serve it. I just graduated one year ago. In asking certain SPJ leaders where I should start to give back, director at-large was what was recommended. I think change is always good. My platform isn’t motivated by what is wrong. My desire and contribution is to serve the community. Change is always inevitable in some form. But I don’t go into this with thoughts on what those would be. Hello, I’m the new kid on the block. It’s important to me because it’s a guiding force that supports a community of people who make up the fifth estate. Whether reporting from the front lines about war-torn countries or from a small farm town, SPJ is a source on many different levels. It lends credibility and support to that same group of people who at times are under attack, going out on a limb, following a hunch and all are simply doing a job that benefits countless others. Aside from being named Utah State University’s first Media Scholar, joining the ranks of professionals that I respect. Yes, I support the proposal for a smaller, more strategic board of directors. I agree with Joe Skeel’s assessment that if the Society wants to maximize its potential and remain relevant into the future, a radical change to its structure and culture is necessary. I support creating a three- to-five-year strategic plan to guide SPJ. I agree that board members crafting that plan would be a leaner group elected because of their ability to provide strategic thinking and guidance. I also agree with the proposal to remove regional directors from the national board. But I have some concerns that with no board seat, the regional coordinators (what they would be called if the proposal passes) may not have the voice they need. One way to resolve this within the proposed structure is for one of the appointed seats to be given to a regional coordinator. I hope it would be the opportunity to help guide the Society through the transition to a smaller, more strategic board if the delegates approve the Government Task Force’s proposal. I have served on the national Ethics Committee since 2010, and I’m extremely proud of the work we did in 2013-2014 that led to the adoption of the revised Code of Ethics. SPJ has been my passion since I was 18 and elected president of the UCLA chapter. Its mission is something I have embraced since my college days, and its focus on ethics, freedom of information and diversity I think are more important than ever to achieve the Society’s mission in today’s challenging times. As a reporter for the Los Angeles Daily Journal, the largest daily legal affairs newspaper in the country, I reestablished the civil courts beat, which had been dormant for more than 10 years. With the nation’s largest civil courthouse in downtown Los Angeles, I regularly delivered important news to a professional community. Not only did I report on important cases heard in the 50+ courtrooms, but also covered the judiciary as a branch of government, coverage lacking in mainstream media in Los Angeles. When there was a shooting in one of the courtrooms, a news analysis I had written the previous year was something many other news outlets turned to for insight because it described the lack of security and other problems at the courthouse. After having served on numerous educational, corporate, social and foundation boards, I can safely say that there is no one that is a “best” candidate for participation on a board of governors. Each member contributes based upon their own experiences and skills. It is the blending of those skills that make a governing board successful. I went to high school with one of the greatest basketball players of all time. He set records in high school, college and into the pros that have yet to be broken. Unfortunately, he was always a phenom and for that reason, he was a “one-man” team and was seldom on a winning team! His name was Pete Maravich. I went to college with another basketball phenom (David Thompson) whose skills were legendary. Fortunately, his coach built a TEAM around him that complimented his skills. That was the year that N.C. State vanquished Bill Walton and the mighty Bruins of UCLA. It was a lesson to me that has followed me throughout my career. I have confidence that Joe and his team have analyzed the situation and have made a choice that they feel will make a difference to the organization. Nothing is carved in stone, so if the overhaul fails to achieve its goal, it can be changed. Communication from both inside the field of journalism and its outside perception is critical. We live in a time of media’s veracity being questioned. Certainly the opinions within the journalism community are critical, but so are the observations from outside the field that need to be considered. I was in Charleston, S.C., recently and noted a plaque on the wall of an old home. It was presented by Sigma Delta Chi in the early 1900’s. To have a society dedicated to a single profession for so long is something worth preserving. Journalism is under attack and, as has been written, “the pen is mightier than the sword.” A free press is a critical force for human freedom. I wrote a piece on the economic implications of the robotic (4th industrial) revolution. It was picked up by the Chartered Financial Analyst Digest and carried as the cover story for their publication in Fall 2015. The acclaim of that article helped me to launch my weekly publication, The Bot Brief, that is dedicated to information about artificial intelligence, automation and robotics. I can say without hesitation that I do NOT know that I am the best candidate for the position. And to my mind, those who indicate they are the best aren’t being fair to the process or to our stakeholders. That type of sentiment (“I am the best”) is only available to someone who has taken time to personally speak with each candidate and evaluate what they offer. That said, I can share that my knowledge and understanding of board governance is high and that my prior board experience has prepared me well to serve on the SPJ board. I also have a keen understanding of the challenges and opportunities we face — both as journalists and as a membership-based organization — and that I welcome the opportunity to participate in our short- and long-term planning. Yes, especially knowing that the board recently took a deep dive and thoroughly examined all of the options for optimizing its ability to operate as a governance board. In my experience, smaller boards are nimble and highly responsive to staff’s needs and recommendations, and if in touch with their stakeholders — which ours is — are wholly representative of member interests and needs. While our organization’s bylaws have been recommended for an overhaul, nothing has been done to address the underlying cause of board dysfunction at SPJ. Namely, that the board operates without the aid of a governance model. For anyone unfamiliar with this, a governance model supports the predictable work of a board, further defines its role, and ensures it focuses on both its fiduciary AND planning-related responsibilities and opportunities. Unlike Roberts Rules of Order, which dictate how meetings are run, or bylaws, which indicate the rules of the organization, a governance model identifies the operational role of the board and how exactly it interacts with staff. And while it’s true that some aspects of the organization’s bylaws speak to the operational role of board positions, the bylaws do not state what governance model guides us or how that decision is made in the first place. Without a governance model in place, the board is led in a different direction each and every time it seats a new term. Much like a parade whose route is chosen by its marshal, the route constantly changes, propelled by the whimsy of someone who knows nothing about parade route planning. With a governance model in place, the board’s approach to its work is predictable and everlasting. The fact that our board operates without a governance model is very telling and should be addressed ASAP. As my professional membership association, SPJ provides me with insight and counsel on a variety of topics related to the work I do. From our Code of Ethics to the resources available to members through the website, SPJ membership enhances my thinking about my profession and my work itself. I’ve had a number of memorable achievements, including co-authorship of several books, but I’d like to think my best moment is still to come. If elected by my peers to serve on the board of directors of the leading organization in our field, doubtless that will become my best moment and achievement in journalism. A successful board needs a group of qualified people with an array of skills — and our board is lacking when it comes to digital media. You might say I’m no longer a traditional journalist, and that’s just fine. But the board needs someone with my skillset: a writer and communicator who deeply understands social media, branding, website UX and email marketing. We’re an organization who represents talented journalists who communicate all day, yet we can do so much more to communicate to our members and the public. I’ve been a part of SPJ on the local level for the past eight years, proudly serving on the SPJ Florida board. We’ve won Chapter of the Year three times since 2010 and launched successful events that have been recreated around the country. I’ve volunteered on the Day of Giving, Resolutions and Communications committees, but I’m ready to formally take my experience to the national level. Absolutely. I support the Governance Task Force’s recommendation to assemble a smaller board that will be better suited to tackle issues quicker and take SPJ to the next level. I strongly believe in the old “too many cooks in the kitchen” adage. Getting 23 people on the same page, or even on the same conference call, is tough and often unproductive. A board of nine will be able to meet more often, focus on more issues, be much more efficient and essentially just get more done. With less people to elect, we can also focus on quality over quantity, ensuring only the best serve on the board. Once elected, I plan to work diligently to enhance SPJ’s internal and external communication. Working with headquarters staff, I will help develop an overarching digital strategy for SPJ that will include specific strategies and processes for handling communication via the website, email and social media. This level of communication is integral to maintaining and growing membership, news literacy and informing the public about SPJ’s mission and actions. This year, I was honored to serve on the Day of Giving committee and worked closely with headquarters staff on the full day-of communication plan — which included emails and multi-platform social media post throughout the day. The campaign was a huge success, raising more than $22K in 24 hours. If a strategy we developed for one day of communication was this successful, imagine the success ahead when we revamp SPJ’s overall digital strategy. As co-chair of SPJ Communications Committee, I had the honor of joining the national board in San Diego last January. Together, we took a critical eye to the organization’s five-year plan and SPJ’s role in today’s climate. We redefined our goals, outlining next steps to continue the fight for press freedom, mobilize journalists to educate the public, ensure SPJ dedicates itself to the inclusion of all who practice and support ethical journalism, and lastly, to provide the support and services that make membership essential. This experience prompted me to run for the board. Your vote will help ensure we finish what we started. The reasons I joined SPJ are the same today as they were back in college: to meet (and work with) like-minded professionals, do innovative programming and have the opportunity to impact the future of journalism. In 2007, I was the co-creator of a local college journalism event called the First Amendment Free Food Festival. The interactive event teaches students the importance of the First Amendment by experiencing a world without those freedoms. Since then, the event has been recreated at more than 35 campuses across the country, several of which were later funded by SDX and SPJ national grants. Many SPJ college chapters, such as University of Florida, have made this an annual event held on Constitution Day. There are so many amazing candidates this year. It is truly a blessing to be among them. In order to gauge the best person for this position, I invite the voting members to assess what they want out of SPJ as a whole. If as a member, you are happy with how things are currently, then I am likely not your choice. By nature, I am a problem solver and seek to improve and expand involvement in any organization I am involved with. That was why I decided to help take over the leadership for the International Community, because I knew it was important to have its presence and I was capable to grow it. It took a matter of time, patience, and listening to the members. I am an advocate that you cannot have change if you continue to do the same actions. I do believe that some significant changes need to take place in the core of the organization in order to see it grow. This is quite possibly one of the most dynamic and exciting times to be a journalist and there is no reason why SPJ should not see that growth and comradery at this time. I think that if the members of SPJ would like to see more being done within the organization, there needs to be a restructure. By taking on this change, we can see efficiency and streamlined decision-making in a timely manner. This rings true with any organization and it is simply a matter of making sure that SPJ as a whole can progress on the same level as other successful organizations. I am an advocate for communication. I would push forward a plan to get a clear line of communication created between the board, region leaders, communities and members. In any line of communication, listening is always the most important. We cannot know the needs and wants of the members if we do not listen. As I did with the International Community, I would like to assess the needs of the members and put into action any solutions that would help maintain and grow our overall membership. I would also like to assist in getting SPJ on the radar for the work it does on a global scale. I am currently a chair for the International Community. I made a commitment this year to not only grow the community, but to actively listen and provide the resources they need to do the work they need to do safely. It took quite some time to find the right pieces of the puzzle, but I am excited that we went from 28 members in the community to now more than 200 members (internationally) and we continue to grow daily. Also, I spent this year assessing the needs and requests of the members and am very proud to announce fantastic partnerships at EIJ that I know will help grow our community and give them the resources/tools to be the amazing journalists I see every day. For those interested in hearing about the collaborations, please do join the International Community for our session on Sept. 8. More details for the room will be available closer to the date. On the same note, with the help of Lynn Walsh, the current president, I was able to push the need to include more international journalists to attend our EIJ conference. By providing them support and guidance, we have seen more than 75 international journalists reach out to show their interest and need to attend our conference. This is amazing! I first began my involvement with SPJ with the International Community. From being a member to becoming a chair in the community years later, I’ve realized the importance of those that lead in organization. I made a commitment to myself to be involved and give back to the community as long as my expertise and skills can help it grow and serve the members. SPJ is one of the longest established organizations for journalists and with that has a great deal of respect. As I travel to various locations abroad, journalists look to us in the U.S. and the SPJ for guidance and assistance. We as an organization are so much more than many realize. The perspective I’ve come to realize this year comes with the requests received from journalists and other organizations to the International Community to collaborate and help with growing their skillsets as a journalist. Many countries still look to the U.S. for the standards of training and skills that are available for our colleagues. With that holds responsibility. We have a unique opportunity to provide that. This year, I began the women’s series for the SPJ International Community and it has grown into something that I am proud to be a part of and have started. I’ve had so many colleagues from all over the world share their stories, achievements and obstacles. They inspire me every week for letting the public see their vulnerability and honesty. It’s conversations like this that give me inspiration, by supporting others. I am the best possible candidate for this position because I believe in our members and our people. The work I have done on a national scale was done because the work that we do is rooted with our members. I want to ensure that our members are at their best, and have an SPJ that works for them — because when we are at our best, our audiences are, too. Education is a valuable investment, and we have an obligation to be a partner in a journalist’s education — be it an early career journalist like myself or someone who has been in the industry for decades. I have been a champion for education and it will be reflected in my work should I be elected. Our members are the future of this industry. I believe in them, and SPJ should, too. Yes, I am in favor of the change. I share the sentiments that you conveyed in this blog post from last month. We tend to think a lot about metrics. We have had a debate as of late as to the decline of membership, and there have been calls by a lot of people, whose intentions are good, for changes to this organization, notably through resolutions at EIJ. We can make calls to increase our membership, and make our manifestos about increasing our members — and while the intentions of those who decide to do so are good and valuable, it is not worth pursuing unless we take the time to engage members and give them something that is worth supporting. That is why education is crucial and should be a fundamental part of SPJ’s work, which in turn, gives them a reason to renew their membership with us. This can also be said for EIJ, which was recently been the subject of criticism because of the selection of programming, especially within areas SPJ cares about, including ethics. I think the selection process for EIJ programming should be reformed — because there are areas that we need to have conversations about. It is more than just about things you can take away for skills. It also involves things you can take away in the thought process in journalism. For when all is said and done, this isn’t about us. This is about our audiences. When we are at our best, and we have these conversations, our audiences can be, too. We have two options: Change the structure and make it just about numbers, or take time to invest to ensure we can do the best possible work and do something that is meaningful. I know which one I’d choose. I was proud to be at the helm of SPJ’s network of communities as its community coordinator for three years. Though the system is not perfect, it shares the need and the desire to educate and to ensure our members are at their best. This is YOUR SPJ and YOU should benefit from it! That is my philosophy and I will honor that if I am elected. Fred Rogers once said that life is for service. Journalism is a calling, and it is a necessity, especially in a time where the internet and social media are changing how we think about it, and the blunt, uneasy criticism from the Trump administration and others is challenging its role. As life is for service, then journalism is one of the most important professions one can be in. We enter this profession not to achieve fame or fortune, but to inform, educate and engage — so the people we serve can be at their best. Journalism is at its best when we are at its best, irrespective of platform or beat, and SPJ’s dedication for and need to educate and engage is quintessential. If SPJ doesn’t do it, who will? I find it rewarding that the content I write is having an impact on people, whether they be in Ohio or Alabama, Minnesota, New York or California, whether it’s a blog post I write or a column they read in Quill. I want to ensure journalism is at its best so the world can be at its best. It is all I want to do, and any indication that I get, whether on Twitter or an email or otherwise, is extremely gratifying. I’ve loved SPJ since the moment I joined my student chapter as a college freshman. SPJ has been some of the best moment of my college journalism career, and I’m excited to help create opportunities for others to have those same experiences. I’ve served as freshman liaison, as treasurer and as president of the Ohio University chapter, the current national Outstanding Campus Chapter of the Year. I have the experience necessary to know what it takes to be a student member and a leader of a student chapter, as well as what it takes to support those roles. If we can get students to join SPJ, we will create lifelong members who love and want to support the organization. It’s important to connect with those members, and I know I have the experience necessary to make the national seem like less of a scary, overwhelming entity and more like the group of fantastic and supportive people it is. I support the opportunity to make our board more effective, but I worry greatly about potentially removing student voice from the board. Students matter in SPJ — they make valuable contributions to journalism and further the mission of SPJ every single day, and it seems reckless to remove them from the board. I want to push for our energy to be more focused on digital innovations and what it truly means to be in a newsroom today. That takes the form of webinars, of meet-ups, of supporting student members in equal measure to professionals. We have to pave the way for both the future of journalism and for those who will come after us, and I think it would serve SPJ well to set the standard in focusing on digital innovation as it applies to newsrooms. Some of my proudest SPJ achievements have come at the local level in my work with the Ohio University campus chapter of SPJ. We have some long-standing programs, such as our annual “Grammar Smackdown,” a universitywide grammar competition that we’ve inherited from past leadership. Something I did during my time as an SPJ leader was innovate the programs so they were more user-friendly and allowed for more people to get involved. Sometimes that’s a simple as putting our email list registration online rather than having a physical sign-up form, but for Grammar Smackdown, that involved helping to find a more digital-solution to take our competition from a paper-and-pencil battle to one fought with cellphones and laptops. It helped us demonstrate a better understanding of who we work with each day and made it a better experience for everyone involved. SPJ has been part of my life for as long as I’ve identified as a true journalist, and in no small part, my SPJ membership is a major contribution to my identity as a journalist. The Society of Professional Journalists does fantastic work to promote freedom of press and freedom of information, values we especially need to cherish in the current age. SPJ is important to me because I know the organization fights for what is most important to me both as a journalist and as a citizen, and that’s not something you can get elsewhere. Far and away, I think my favorite moment as a journalist was getting email records from public officials that others told me were unobtainable. I hit every road block possible, but through persistence and a surprisingly deep understanding of state record laws, I got the records months after the original request was made. Those records contributed greatly to a story I wrote that affected many people, one that helped better a problem within my community. SPJ was no small help in both the knowledge and confidence boost necessary to get those records, and I’m proud to be a member. Today, when many people of the older generation are going back to school or starting careers later in life, it is imperative they have representation on organizational boards that help them excel in their career goals. Many of those in a student representative position are considered of the stereotypical age. I am a mother of two, a grandmother of five, a career volunteer with years of advocacy work experience. Also, I am a double major college student living with disabilities. I believe there are many students in various situations who I can help. I support the overhaul and welcome changes in the structure of the board of directors. Our world is dramatically changing especially in this year alone. I think it is inevitable and pertinent for any organization to evolve to keep up with the changes. I would like to see more emphasis put on the different forms of journalism, such as freelance. In the time I have spent with the SPJ Freelance Community and on their board, I often hear within the conversations how many of the traditional methods of journalism are forgotten about. I would also like to see more interacting platforms for seasoned journalists and newcomers to the industry. I do not know of any specific examples of a change I have made or helped make within SPJ. I would like to think I have helped on some level within the SPJ Freelance Community developing new ways to communicate and engage with other freelancers. SPJ is important because without it, I would not have met so many wonderful mentors. The ability to interact with seasoned journalists and network with those having similar career goals is invaluable. In my college classes, I have many students contacting me about SPJ because my introduction and bio are filled with SPJ benefits. I believe SPJ is a lifeline journalists can benefit from throughout their entire journalism career. I know it may not sound like much my best moment or achievement in journalism so far are praises from my college instructors and building an SPJ identity at my school. I am just starting my journalism career. Any recognition or achievement is a learning tool, and I am cherishing everything about my journalism journey. I am completing my first term as regional director for Region 10, but I’ve been helping out behind the scenes in an unofficial capacity since I joined the Western Washington Pro chapter board in 2012. My recent experience with contest and conference planning, contest organization, programming, institutional knowledge, SPJ board-level communications, passion, patience, and integrity are assets to the region. I have been in talks with members from Montana to revive the pro chapter, and have been working with students at University of Washington Tacoma to start a new student chapter there. I have an understanding of the demands of the position and am prepared to work harder than ever to make sure that journalists in Region 10 get the most out of SPJ. I support the plan to overhaul SPJ’s board of directors. I’d like to see a more nimble, flexible board. In its current state, the board seems a little too large to function in the most effective manner. I like that eliminating the regional directors from the board of directors would allow whoever is in the position to focus more on the region. I am eager to hear feedback from membership on this matter. I’ll answer this in a couple of ways. If the plan to overhaul SPJ’s board of directors doesn’t pass, then this position will remain on the board. If I continue as Region 10 director, I’d would like to join the Diversity Committee. As a POC with unique experiences in journalism and life, I’d love to be part of a bigger discussion regarding SPJ’s work in diversity and inclusiveness. If the plan succeeds to overhaul the board, I would still join the Diversity Committee, but my primary focus would be to improve the region. I’d like to figure out some new ways to create programming for unaffiliated members. In an area as geographically diverse and large as Region 10, I feel like members who don’t live in metropolitan areas or cities with active chapters often struggle to find opportunities for community within SPJ. I have several ideas to combat this, but one thought is to create a sort of “virtual chapter” within the region for unaffiliated members. We can use technology to create continuing education programming for these members, recruit speakers to give web talks, hold forums, and more. I’d love to see more collaboration between student chapters as well, and aspects of this “virtual chapter” model could be of use to student chapter and advisers. There have been several, but my recent time on the Quill committee has been particularly interesting. With more than a dozen years in magazine journalism, I felt I had some thoughts to contribute how this publication will be produced and consumed by leaders and members. The committee debated and created recommendations for SPJ staff, and I am excited to see how they will be implemented. Journalism is my job and being a member and leader of SPJ makes me better at what I do. Continuing education, resources, programming, and access to incredibly smart people have made me a better journalist and a better person. But in the greater scheme of things, I’d argue that SPJ has never been more important to every American citizen. A free press is essential to our democracy and there’s no better organization to stand with to vigilantly protect those ideals than SPJ. I’ve won several awards for headline writing, been a part of award-winning journalism teams, including one that earned a Sigma Delta Chi award for its coverage on family homelessness. I’ve written stories about brain cancer treatments, profiled startup businesses and celebrities, and delved into the fascinating lives of everyday people. I’m currently working on a wide-ranging feature about immigrant experiences. I’ve had numerous highlights throughout my career, but I believe that the best moment is yet to come. That idea drives me to constant improvement. I am an experienced SPJ leader, having served as a regional director in Region 9 for four years. I know what it takes to represent the interests of the entire region and having a regional conference that brings students and pros together. I also believe that an RD should be in regular contact with chapter leaders throughout the year and not just at regional conference or convention. I support the change as it would allow directors to concentrate more on working with the chapters and members in their regions. However, I would continue to make sure the concerns of our region are heard at national. I would make SPJ even more of an advocate for journalists and free expression. I would push for SPJ to be even more on the forefront of First Amendment activities. I want people to think of us first, and not other organizations, when they look for someone who stands up for those rights. I would also expect RDs to be advocates on the regional level. I worked with David Cuillier and Hagit Limor to create the national Black Hole Award to recognize egregious violations of open government. I also nominated the Utah Legislature for gutting Utah’s public records law. That was a factor in getting that bad law repealed. For me, SPJ represents the best in journalism. Its ethics code is the industry standard and has been a great guide for me. SPJ has also helped me become a better journalist through its programs and the chance to rub shoulders with the best in the business. Fighting for access to finalists for Orem City Manager. With SPJ’s help, I was able to sue for the information, which led to other organizations releasing finalists’ names. There’s a subtle free-press debate going on in the Maryland General Assembly. Last month, while sitting in the press area in the Maryland Senate, reporter Bryan P. Sears of The Daily Record, as he has done many times, videotaped a senator’s floor speech. However, as the speech concluded, Senate President Thomas V. Mike Miller Jr. reminded the chamber that videotaping is allowed only if permission is granted. The press may observe Senate actions and take notes, but may not shoot photos or video unless the Senate president says so. But House Speaker Michael E. Busch doesn’t enforce the rule. Journalists may shoot photos or video of proceedings from the designated press area at any time. Why have a rule if it’s not enforced? That’s a good question. Miller had not been enforcing the rule before, either, but his warning to Sears/the chamber changed that. Now, journalists must ask Miller’s staff every day for permission to photograph and videotape, on the off chance they might want to do either during that day’s Senate session. I don’t know of anyone being turned down for permission. So, why have that rule if everyone gets permission, every time? If you don’t ask for that daily permission, you may not pick up your smartphone and videotape when an interesting, unplanned debate unfolds before you. A few days after issuing the reminder to the chamber, in announcing that journalists had permission to videotape that day, Miller joked with senators that a video clip of their comments might show up in a campaign ad. That ignored the fact that the audio of each day’s House and Senate sessions already is broadcast live, then archived. Anyone looking for a soundbite for later use already has a way to get it; whether the press videotapes that day changes nothing. SPJ objects to these limitations on the press, which have a discriminatory side effect: Observers sitting above in the gallery of the Senate chamber may videotape without prior permission; the press may not. On Feb. 10, SPJ President Lynn Walsh sent a letter to Miller, Busch and their aides, urging that the rule be stricken for each chamber. SPJ also is asking that a new rule be written clarifying the rights of journalists to fully do their jobs during open sessions of the state Legislature. Despite the House rule, Busch has not kept journalists from photographing or videotaping without prior permission. But the rule is in place in both chambers, and could be arbitrarily enforced in either, so SPJ sent the letter to Busch, too. 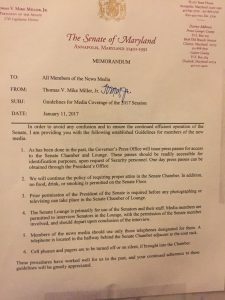 We are writing to discuss a rule that limits photography and videotaping by the press in the Maryland Senate and House chambers without prior permission. The rule became recently when President Miller reminded Bryan Sears, a reporter for The Daily Record, as he was videotaping a floor speech in the Senate, that he needed to get permission first. Perhaps this rule made sense years ago, when videotaping was only done by camera crews, requiring large equipment that might have been a distraction to, or even interfered with, the legislature’s operation. The media landscape has greatly changed. 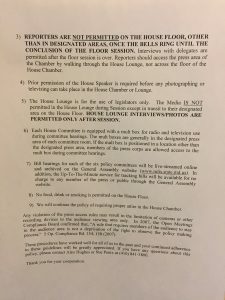 Now, during chamber sessions, journalists might take notes for a future story in print or on the web, but they also might cover proceedings live through Facebook, Twitter, Periscope and other platforms, especially since the public cannot watch the Legislature’s proceedings through a video broadcast. We are no longer limited to the specialties we used to have. All that journalists need for multimedia work is a small electronic device, such as a smartphone or a tablet. For videotaping, they hold up the electronic device from their seat and press a button; they don’t interfere and are barely noticed. We have concerns about applying an outdated rule to a current approach to journalism. It has created discriminatory differentiation, as TV crews daily set up in the chambers and are allowed (even without asking permission each time) to get footage for their reports. Other journalists are not allowed to get the same footage for their publications and websites without permission, which is logistically impossible when news develops on the spot. The rule also creates an imbalance in which the public, from the gallery, may take pictures or video clips from their seats, but journalists on the floor cannot without prior permission. President Miller has expressed a concern about legislators knowing they are being taped and that their words might be replayed elsewhere. But the audio of chamber sessions already is broadcast; videotaping by journalists does not change anything, other than matching a face to a voice. We ask that both chambers drop or amend their rule, and rely on current practice, which works well. Journalists who receive credentials through the Department of General Services should be allowed to remain in the press area of each chamber and do their jobs, involving any platform, as long as it does not interfere with the proceedings. Warnings or limitations should be based on that principle, rather than an outdated rule that hampers their work. We also ask that a rule clearly enshrining press rights be put in place, so that there is no confusion in the future. We look forward to hearing from you on this matter. Disclosure: Besides serving as SPJ’s Region 2 director, I am a city editor with The Frederick News-Post, which covers the Maryland General Assembly. Tags: Bryan P. Sears, Larry Hogan, Lynn Walsh, Michael E. Busch, The Daily Record, Thomas V. Mike Miller Jr.